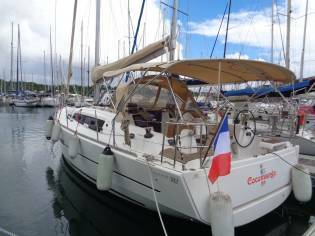 Well maintainend Dufour 382 with 3 cabins, 6+2 berths and 2 bathrooms. 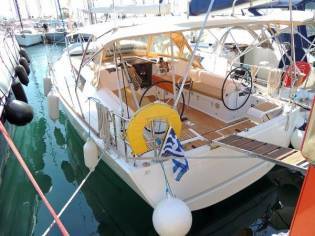 We are able to offer her for a superb price of 110.000 Euro plus VAT. She sails under Croatian flag. This boat was very well maintaiend from outside in. Do not compare this with an average ex-charter yacht as the maintenance done on this boat is superb. 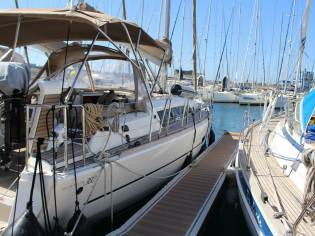 It is equipped with self tacking jib + 108% genoa - therefore both sails with all settings. 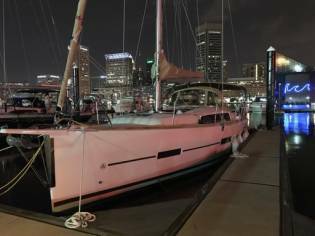 The engine is D2-40 instead of the standard D2-30 Complete interior, safety, deck and charter equipment (sheets, towels, full kitchen equipment, outboard engine, dingy, spade anchor, lines, gangway, navigation, barometar ...etc). All pictures are taken by us and show the actual condition. 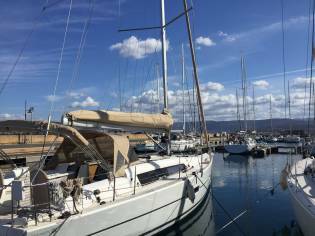 We have inspected this yacht very thoroughly, ask us for more info if required. 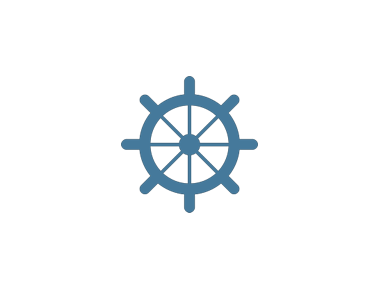 Are you looking for a comfortable, fully equipped, spacious and well maintained yacht? Call or email us for more information or making an appointment in Zadar (Kroatia). General Brand - Dufour 382 Grand Large Year - 2016 Shipyard - Dufour Yachts Hull shape - roundbilge Deck development - grp (polyester) Displacement - 7,060 kg Steering unit - 2 wheels leather covered Accommodation L-shaped living room with living room desk Cabins - forecabin with double cot and safes, 2 aftcabins with double cots and safes Berths - 6+2 Type inside - Modern, wood look Water basin - 380 litre Water basin gauge Waste water basin gauge Hot water - 40 litre of hot water Toilets - 2 quantity with hand-operated Jabsco toilets Radio/CD stereo - Kenwood CD stereo and inside/outside speakers Cooker - burner gasoline stoves Oven Fridge Heating Engine, electrics Category - inboard Brand - Volvo Penta with sail navigate and 2 blades Model - D2-40F Power - 1x 29,1 kW Fuel - diesel Cooling unit - indirect Fuel basin(s) capacity - 200 litre Fuel basin gauge Oil pressure gauge Batteries - 2 assistance batteries and 1 engine charger Battery charger Voltmeter Shore potential Shore potential cable Voltage - 12V/220V Navigation and electronics Compass - Plastimo Log/speed - Raymarine Depth gauge - Raymarine Wind instrument - Raymarine Navigation illumination Charts, guides Autopilot - Raymarine GPS - Raymarine Chart GPS VHF - Raymarine Rig and sails Aluminium mast with 2 spreaders Main sail - Full Battened 36.00 m2 Genoa - Furling 22.00 m2 Offsand Genoa 108% Gennaker Winches - 4x Lewmar 40 winches Aluminium boom Rodkicker Deck hardware Rutgerson Steering wheels Lwemar Roller furler Deck Equipment Anchor with chain Anchor gustlass - electric Sprayhood Bimini Swimming floor Swimming ladder Fenders, lines Cockpit desk Cockpit seats in teak Safety Life buoy Life raft Bilge pump - Manual and Electric Fire extinguisher Radar reflector Flares Life jackets Gas bottle safe Fog horn Binoculars Torch Bosun's seat etc. 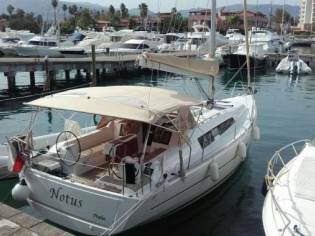 Prices of Dufour 382 Grand Large boats from 2016 advertised in iNautia.com in the last two years. The price of the advert is outside of the usual range of prices. Contact the advertiser to confirm that the price is correct. 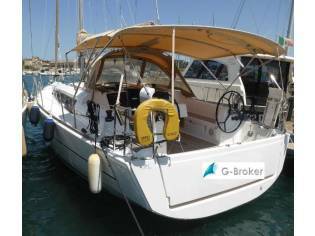 It is a sailing cruiser, manufactured by the shipyard Dufour in the year 2016 and has a sale price of 110.000€.